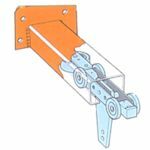 An overhead conveyor is simply a conveyor chain contained within a track, moving in defined circuit. Products are attached directly to the chain via pendants. Power and Free conveyors are more sophisticated and allow for independent product movements. Standard Overhead Conveyors – the circuit can be any configuration, with horizontal and vertical bends, and is driven at the (variable) speed required. Products are attached to the chain and travel at the same speed and stop at the same time. Power and Free Overhead Conveyors include a second track below the chain track. This lower track contains independent trolleys, from which objects are suspended for transport around the circuit. The chain includes special dogs which engage and push the trolleys around the circuit. The system includes horizontal and vertical bends, track switches, auto-accumulation, storage lines and can be inverted and even floor-based. Parts of the circuit can be unpowered (free), providing off-line facilities for time-consuming operations. Individual trolleys can be disengaged on-line, while everything else keeps moving and any following trolleys automatically accumulate – ideal for storage lanes. The Power and Free system is best thought of as a train set, but where every carriage can be moved independently -its configuration and use is limited only by imagination.